Dishonored 2 is a shooter where we will handle a deadly murderer with supernatural powers. The next release of Dishonored franchise is getting closer and its launch is scheduled for 11 November 2016. 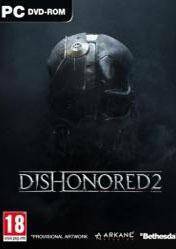 This product includes the original game Dishonored 2 and the first DLC Imperial Assasins. This DLC includes items like Duelist's Luck Charm Bone, Bone Void Please Charm, Goodbye, Lore Karnaca Guitar Book and Antique Serkonan. In addition to 500 Coins to spend on the game. One of the innovations of this new release is that players can choose who to play, either as Emily Kaldwin or Corvo Attano. Besides this novelty, also we´ll enjoy a whole new world, full of enemies and secrets, and a huge assortment of new powers specially designed to cause suffering to our enemies. In addition, we will can update and improve them to make them more devastating. There are no comments yet about Dishonored 2 + Imperial Assasins DLC. You can be the first one! What's Up With Dishonored 2's DLC? Dishonored 2 Brutal Kills "MONTAGE"